Charles FARR [Parents] [scrapbook]-8311 was born 1, 2, 3, 4 about 1806 in Chesterfield, Cheshire, New Hampshire, United States. He died 5 on 19 Nov 1880 in Saranac Lake, Franklin, New York, United States. He was buried in Nov 1880 in Dickinson, Franklin, New York, United States. Charles married 6 (MRIN:3661) Polly BARBER-8315 on 4 Jul 1829 in New York, United States. Charles Farr was warned out of Vermont along with his wife Sarah, and Calvin Farr, Caleb, wife Amey, and Charles, Laura, Chauncy, and Mary. Polly BARBER [scrapbook]-8315 was born 1, 2, 3, 4 on 20 May 1801 in Dummerston, Windham, Vermont, United States. She died 5 on 5 Mar 1885 in Dickinson, Franklin, New York, United States. Polly married 6 (MRIN:3661) Charles FARR-8311 on 4 Jul 1829 in New York, United States. BIRTH: The 1870 census says that she was born in New Hampshire. F i Amy Jerusha FARR-8316 was born on 25 Dec 1833. She died in 1900. M ii Isaac Titus FARR-8317 was born in Nov 1836. He died on 4 May 1908. F iii Laura Sophia FARR-8318 was born on 28 Oct 1840. She died on 2 Aug 1905. Mary FARR-8319 was born on 28 Oct 1840 in Franklin, New York, United States. She died about 1841. M v Allen Whitney FARR-8320 was born on 4 Feb 1842. He died on 23 Dec 1922. F vi Mary Alvira FARR-8321 was born on 22 Nov 1844. She died on 3 Jan 1909. Juba PRENTICE [scrapbook]-8331 was born 1, 2 on 22 Feb 1803 in Vermont, United States. He died 3 on 3 Apr 1880 in Dickinson, Franklin, New York, United States. Juba married 4 (MRIN:3662) Mary Luna FARR-8313 in 1828 in New York, United States. Mary Luna FARR [Parents] [scrapbook] 1-8313 was born 2 on 6 Oct 1807 in New Hampshire, United States. She died 3 on 19 Oct 1875 in Dickinson, Franklin, New York, United States. She was buried 4 in 1875 in Dickinson Center, Franklin, New York, United States of America. Mary married 5 (MRIN:3662) Juba PRENTICE-8331 in 1828 in New York, United States. Mary was counted in a census 6 in 1850 in Brandon, Franklin, New York, United States. She was counted in a census 7 in 1860 in Dickinson, Franklin, New York, United States. She was counted in a census 8 in 1875 in Dickinson, Franklin, New York, United States. Safford Gerry HAZEN-8332 was born 1 on 6 May 1821 in North Hero, Grand Isle, Vermont, United States. He died 2 on 18 Apr 1862 in Newport News, Newport News (cit, Virginia, United States. Safford married 3 (MRIN:3663) Amy Rosina FARR-8314 on 18 Nov 1843 in Alburg, Grand Isle, Vermont, United States. Safford was counted in a census 4 in 1850 in Dickinson, Franklin, New York, United States. He was counted in a census 5 in 1860 in Dickinson, Franklin, New York, United States. 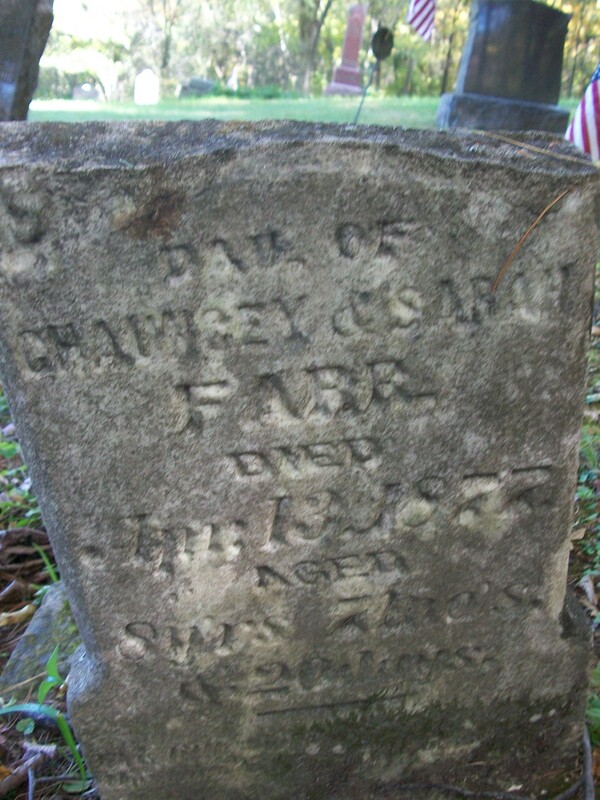 Amy Rosina FARR [Parents]-8314 was born on 14 May 1823 in Vermont, United States. She died on 30 Nov 1912 in Nicholville, St. Lawrence, New York, United States. Amy married 1 (MRIN:3663) Safford Gerry HAZEN-8332 on 18 Nov 1843 in Alburg, Grand Isle, Vermont, United States. Christopher MULHOLLAND-8333 was born 1, 2 on 23 Dec 1817 in Moneghan, Ireland, United Kingdom. He died 3 on 20 Apr 1883 in Franklin, New York, United States. He was buried in Ives Cemetery, Dickinson, Franklin, New York, United States. Christopher married (MRIN:3664) Amy Jerusha FARR-8316 on 1 Aug 1854 in New York, United States. Amy Jerusha FARR [Parents] [scrapbook]-8316 was born 1 on 25 Dec 1833 in New York, United States. She died in 1900 in Franklin, New York, United States. She was buried in Ives Cemetery, Dickinson, Franklin, New York, United States. Amy married (MRIN:3664) Christopher MULHOLLAND-8333 on 1 Aug 1854 in New York, United States. Amy was counted in a census 2 in 1850 in Brandon Center, Franklin, New York, United States. Isaac Titus FARR [Parents] [scrapbook]-8317 was born 1, 2, 3 in Nov 1836 in Franklin, New York, United States. He died 4 on 4 May 1908 in Waverly, Franklin, New York, United States. He was buried in Forest Cemetery, Waverly, Franklin, New York, United States. Isaac married (MRIN:3665) Lura MOSIER-8322 on 4 May 1856 in New York, United States. The funeral of Isaac Farr occurred at his late home in the Farr district on Wednesday. He had been ill for several weeks of heart trouble. Mr. Farr was well and favorably known in this vicinity. He leaves a wife and two children, Mrs. George Parks, of St. Regis Falls and Mrs. Henry Prentice, with whom he lived. Besides these he leaves a brother, Allen Farr and Mrs. Alivira Barber to mourn his death. Lura MOSIER-8322 was born 1, 2, 3, 4 on 15 Sep 1836 in Dickinson, Franklin, New York, United States. She died 5 on 18 Jun 1916 in Franklin, New York, United States. 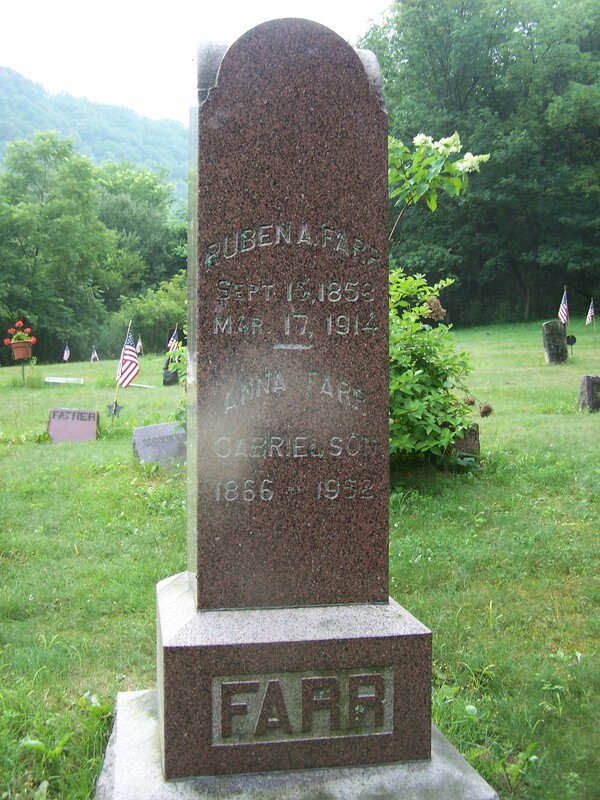 She was buried in Forest Cemetery, Waverly, Franklin, New York, United States. Lura married (MRIN:3665) Isaac Titus FARR-8317 on 4 May 1856 in New York, United States. Lura was also known as Luna. Lura Farr, widow of the late Isaac Farr, who resided in what known as the Farr district three or four miles east of this village, June 18th after a short illness of pneumonia. The deceased has spent her long life in this vicinity, being born in the town of Dickenson on Sept. 15th, 1836. Mrs. Farr was a woman highly spoken of by all who knew her. Her funeral was held at the home, burial in Forest Cemetery. Mrs Farr is survived by two daughters, Mrs. Henry Prentice and Mrs. George Parks. F i Susan FARR-8323 was born on 19 Jan 1858. She died in Jun 1925. F ii Annice "Annie" FARR-8324 was born on 26 Sep 1868. She died in 1941. Daniel E. TOWER-8335 was born 1 on 30 Mar 1837 in Franklin, New York, United States. He died 2 on 6 Mar 1862 in Yorktown, York, Virginia, United States. Daniel married (MRIN:3666) Laura Sophia FARR-8318 on 4 Jul 1860 in New York, United States. Laura Sophia FARR [Parents]-8318 was born on 28 Oct 1840 in Franklin, New York, United States. She died 1 on 2 Aug 1905 in Dickinson Center, Franklin, New York, United States of America. Laura married (MRIN:3666) Daniel E. TOWER-8335 on 4 Jul 1860 in New York, United States. Laura was counted in a census 2 in 1870 in Dickinson, Franklin, New York, United States. She had a will 3 on 28 Jul 1905 in Franklin, New York, United States. Brushton: MRS. LAURA NILES, Dickinson Center. Aug, 7 Mrs. Laura Niles, aged 67 years, wife of Samuel Niles, passed away on Wednesday morning, Aug. 2nd. She leaves to mourn their loss a husband and two daughters, Mrs. Gertie Southwick and Mrs. Luella Mosier; also three sons, William Tower of Iowa, and Daniel Tower of Lawrence, sons of a former husband who died while serving in the Civil war; also her youngest son, Archie Niles, of this place. She was a loving and affectionate mother, and lonely indeed will be the home she has left. The funeral services were held on Friday forenoon at the Baptist church, of which she had been a member many years. The funeral sermon was by Rev, Nelson Ramsdell, an old neighbor and friend of the family. Burial was made in the old cemetery in Dickinson Center. Samuel A. NILES-8336 was born about 1840 in New York, United States. Samuel married (MRIN:3667) Laura Sophia FARR-8318 on 20 Sep 1866 in New York, United States. Samuel was counted in a census 1 in 1870 in Dickinson, Franklin, New York, United States. Laura Sophia FARR [Parents]-8318 was born on 28 Oct 1840 in Franklin, New York, United States. She died 1 on 2 Aug 1905 in Dickinson Center, Franklin, New York, United States of America. Laura married (MRIN:3667) Samuel A. NILES-8336 on 20 Sep 1866 in New York, United States. Allen Whitney FARR [Parents] [scrapbook]-8320 was born 1, 2, 3 on 4 Feb 1842 in Brandon Center, Franklin, New York, United States. He died 4 on 23 Dec 1922 in Saranac Lake, Franklin, New York, United States. He was buried on 26 Dec 1922 in Fairview Cemetery, Dickinson Center, Franklin, New York, United States. Allen married 5 (MRIN:3668) Mary Elizabeth CHASE-8325 in 1862 in Dickinson, Franklin, New York, United States. Mary Elizabeth CHASE [scrapbook] 1-8325 was born 2 on 6 Oct 1841 in Groton, Caledonia, Vermont, United States. She died 3 on 13 Aug 1900 in Dickinson, Franklin, New York, United States. She was buried on 15 Aug 1900 in Fairview Cemetery, Dickinson Center, Franklin, New York, United States. Mary married 4 (MRIN:3668) Allen Whitney FARR-8320 in 1862 in Dickinson, Franklin, New York, United States. Freddie FARR [scrapbook]-8339 was born 1 on 8 Feb 1862 in Dickinson, Franklin, New York, United States. He died 2 on 18 Jul 1863 in Dickinson, Franklin, New York, United States. F ii Alta H. FARR-8326 was born on 23 Sep 1864. She died on 24 May 1937. M iii William Allen "Willie" FARR-8327 was born on 8 Mar 1866. He died on 20 Oct 1916. F iv Abbie Whitney FARR (twin)-8329 was born on 12 Aug 1868. She died on 27 Feb 1955. F v Addie FARR (twin)-8328 was born on 12 Aug 1868. She died on 28 Mar 1944. Allen Whitney FARR [Parents] [scrapbook]-8320 was born 1, 2, 3 on 4 Feb 1842 in Brandon Center, Franklin, New York, United States. He died 4 on 23 Dec 1922 in Saranac Lake, Franklin, New York, United States. He was buried on 26 Dec 1922 in Fairview Cemetery, Dickinson Center, Franklin, New York, United States. Allen married (MRIN:3669) Sarah (Woodruff) WELLER-8337 on 10 Apr 1903 in Dickinson, Franklin, New York, United States. Sarah (Woodruff) WELLER-8337 was born about 1842 in Hopkinton, St. Lawrence, New York, United States. She died on 8 Nov 1907 in Dickinson, Franklin, New York, United States. 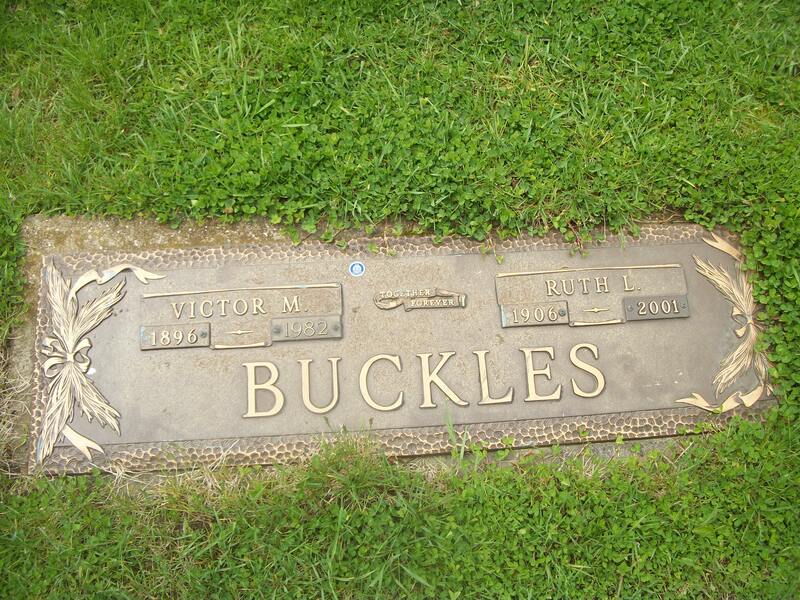 She was buried in Nicholville, St. Lawrence, New York, United States. Sarah married (MRIN:3669) Allen Whitney FARR-8320 on 10 Apr 1903 in Dickinson, Franklin, New York, United States. Allen Whitney FARR [Parents] [scrapbook]-8320 was born 1, 2, 3 on 4 Feb 1842 in Brandon Center, Franklin, New York, United States. He died 4 on 23 Dec 1922 in Saranac Lake, Franklin, New York, United States. He was buried on 26 Dec 1922 in Fairview Cemetery, Dickinson Center, Franklin, New York, United States. Allen married 5 (MRIN:3670) Elizabeth (Shay) MOODY-8330 on 29 Sep 1907 in First Methodist Church, Saranac Lake, Essex, New York, United States. Elizabeth (Shay) MOODY 1-8330 was born on 29 Sep 1851 in Saranac Lake, Franklin, New York, United States. Elizabeth married 2 (MRIN:3670) Allen Whitney FARR-8320 on 29 Sep 1907 in First Methodist Church, Saranac Lake, Essex, New York, United States.